Find out about new approaches and technologies being applied to the search for future therapeutics. Hosted by Takeda, this free to attend, one day symposium, is aimed at scientists from pharmaceutical, biotechnology, agrochemical, flavor and fragrance organizations, not-for-profits and academia who wish to get a broad appreciation of the latest advances in drug discovery delivered by key scientists and thought leaders from leading organizations. Note: Security at the Takeda site requires that advance booking is essential so registration will close on October 10. Do We Need to Change the Definition of Drug-Like Properties? Two decades have passed since the Rule of Five (Ro5) ushered in the concept of ‘drug-like’ properties. Attempts to quantify, correlate, and categorize molecules based on Ro5 parameters evolved into the introduction of efficiency metrics with far reaching consequences in decision making by industry leaders and scientists seeking to discover new medicines. Examination of oral drug parameters approved before and after the original Ro5 analysis demonstrates that some parameters such as clogP and HBD remained constant while the cut-offs for parameters such as molecular weight and HBA have increased substantially over the past 20 years. Additional analyses demonstrates that the distribution of parameters of hits, leads and development candidates have also undergone changes. The time dependent increase in the molecular weight of hits, leads and oral drugs during the past 20 years provides compelling evidence to disprove the hypothesis that molecular weight is a ‘lead-like’ or ‘drug-like’ property. This analysis does not validate parameters that have not changed as being ‘lead-like’ or ‘drug-like’ but instead calls into question the entire hypothesis that ‘lead-like’ and ‘drug-like’ properties exist. Maria Argiriadi,1 Eric Breinlinger,1 Kevin Cusack,1,* Jeremy Edmunds,1 Michael Friedman,1 Michael Hoemann1, Raymond Huntley1, Sami Osman1, and Thomas Vargo1. The small molecule drug design cycle is comprised of multiple discreet steps. Two crucial steps in the design cycle are the ability to find chemical starting points and the ability to rank order follow on concept molecules prior to synthesis. The use of Blaze for hit finding and field-based QSAR within Forge will be discussed within the context of drug discovery projects at AbbVie. All authors are employees of AbbVie. The design, study conduct, and financial support for this research were provided by AbbVie. AbbVie participated in the interpretation of data, review, and approval of the publication. Electrostatic interactions between small molecules and their respective receptors are a key contributor to the free energy of binding. Assessing the electrostatic match between ligands and binding pockets provides therefore important insights into ligand binding and molecule design. The polarizable XED force field is an excellent base for calculating electrostatic properties due to its description of anisotropic atomic charge distributions and relatively modest computational costs. 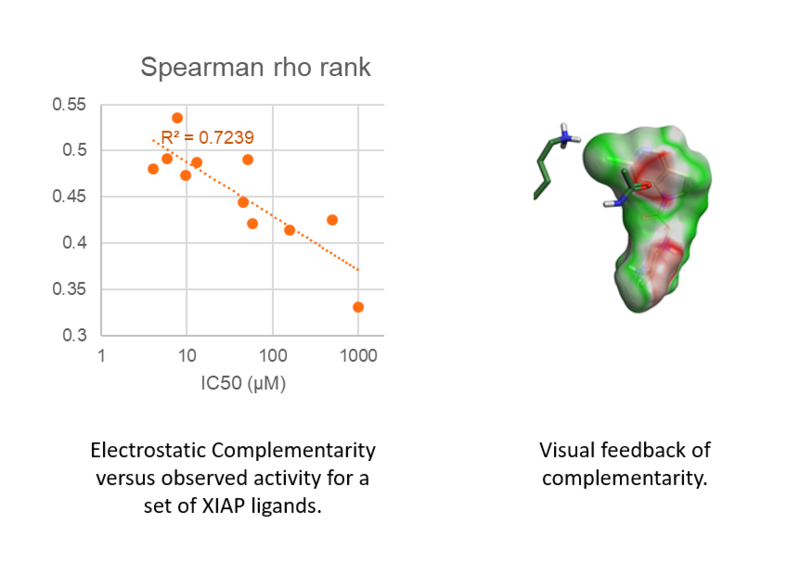 By computing electrostatic potentials for both ligand and protein with XED, the Electrostatic Complementarity™ (EC) of complexes can be calculated and translated into a simple coloring scheme on the ligand and protein surface. We present the theoretical background of our EC calculations and discuss their application to mGluR5, XIAP, and other selected targets. We show how using EC can inform SAR interpretation and new molecule design. The pharmaceutical and biotechnology R&D model for in-house drug projects, and their chemistry components, has evolved over recent decades. The drivers for conducting projects through collaborations using dispersed global teams are readily apparent. Yet various challenges in managing the essential, iterative design – make – test – analyze cycle, have persisted. This joint presentation highlights the nature of the challenges faced, and provides a case history of how iterative design – make – test – analyze cycles can be efficiently delivered through an intuitive, real-time software platform which enables a co-ordinated chemistry contribution to drug projects. Specialization in designing prospective compounds and the complex synthesis required to execute these designs has increased the use of more sophisticated tools across all of medicinal chemistry. The ability to retain, categorize, and retrieve the institutional knowledge being generated in every project is key for long term success and growth. A design/synthesis paradigm was instituted at Abbvie, exasperating the need for better tools to compile, track, and manage data. This talk will encompass our use of the ChemTrax software to address this problem. Drug design is a multi-parameter optimization problem that requires a fine balance between potency, ADME and safety. Although the number of clinical failures from safety has been reduced, there are still improvements that could be made. In addition, there are strong economic drivers to reduce the costs of discovering new medicines. Data science and artificial intelligence is being seen as a potential method to both improve the safety profile of new drugs as well as reduce the costs and time to bring these to the clinic. This talk will highlight some of the current investments in computational methods and highlight some of the key gaps in realizing these benefits. The knowledge of compound bioactivity data against drug targets underpins the discovery of new drugs. However, databases are currently sparse; for example, the ChEMBL dataset is just 0.05% compete and the sparsity of data in proprietary pharma databases is similar. We will describe a novel deep learning algorithm to capture correlations within protein activity data, as well as between molecular descriptors and protein activities, to impute the missing activities. Unlike many deep learning methods, this approach is capable of being trained using sparse and variable data, typical of those available in drug discovery. We will present examples illustrating the application of these deep learning networks to impute missing activities in the sparse input data, as well as to make predictions for new compounds based on molecular descriptors alone. The results will be compared with conventional machine learning methods such as random forests and Gaussian processes. Nigel Greene leads the Data Science and Artificial Intelligence department in Drug Safety & Metabolism in AstraZeneca, and is interested in exploring the application of data science, machine learning, Deep Learning and artificial intelligence methods to develop a greater understanding of mechanism of drug-induced toxicity and their translation into a clinical patient population. Previously Dr. Greene was a head of the Predictive Compound ADME and Safety group in AstraZeneca, and the founder of the Compound Safety Prediction group at Pfizer. Earlier in his career Dr. Greene worked for LHASA Ltd. where he pioneered computational toxicity prediction, and for Tripos Inc. In addition to his current role, Nigel’s other activities outside of AstraZeneca have included being the Chair of the Board of Trustees for Lhasa Ltd. and he has served on multiple National Research Council committees sponsored by the US Environmental Protection Agency, US Food and Drug Administration, and the National Institutes of Health. Dr. Greene received his B.Sc. and PhD from the University of Leeds in the UK. Following a Ph.D with Tim Gallagher and postdoctoral studies with Professor Stephen Hanessian, Andrew moved to the AstraZeneca (Montreal) where he held the position of Associate Director in Medicinal Chemistry. He led multiple chemistry teams within AZ and with external chemistry partners, delivering lead generation projects and clinical candidates. Throughout his career Andrew has maintained a keen interest in using informatics to aid drug discovery and was member of the AZ Predictive Chemistry Network as well as leading a global initiative that provided a platform to facilitate external chemistry and testing. Since 2012 he has become a medicinal chemistry consultant and has been working with Praxis Precision Medicines since its creation. David is Technical Director at Elixir Software Ltd with a primary focus customizing software applications matched to customer needs. Before Elixir was founded in 2012, David spent 28 years within AstraZeneca, initially as a medicinal chemist in the Infection, Cardiovascular & Metabolism Research Areas, then subsequently building technology platforms for Discovery and subsequently Global Process R&D. His roles at AstraZeneca have predicated upon external collaboration for successful project delivery. Kevin has a PhD in Organic Chemistry and is currently working as a drug designer in AbbVie‘s Immunology Group, Medicinal Chemistry Department, Worcester, MA. He is experienced with all aspects of drug discovery from hit finding through lead optimization and clinical progression. Scott earned a Ph.D. in Biochemistry from the University of Alabama in Birmingham working in the Structural Biology laboratory of Charlie Bugg developing methods for Structure-Based Drug Design. Postdoctoral training at the Cambridge Crystallographic Data Centre, UK continued the focus on structural methods for Drug Discovery. Scott joined Takeda Pharmaceuticals in 2002 and is currently an Associate Scientific Fellow leading the Boston Computational Chemistry group in the Oncology therapeutic area. Following a PhD in organic chemistry at the University of Leeds in the UK, Sylvie took a postdoctoral research fellowship at the University of Geneva in Switzerland. In 2000 Sylvie joined BioFocus (now part of Charles River Laboratories) where she led and advanced multiple medicinal chemistry projects on GPCRs to successful collaboration milestones. Sylvie joined Cresset in 2017 where, as an application scientist, she provides scientific and technical support to customers in North America. Matt is CEO of Optibrium. He has a Master of Science in computation from the University of Oxford and a Ph.D. in theoretical physics from the University of Cambridge. As Associate Director at Camitro (UK), ArQule Inc. and then Inpharmatica, he led a team developing predictive ADME models and state-of-the-art intuitive decision-support and visualization tools for drug discovery. In January 2006, he became responsible for management of Inpharmatica’s ADME business, including experimental ADME services and the StarDrop software platform. Following acquisition of Inpharmatica, Matt became Senior Director responsible for BioFocus DPI’s ADMET division and in 2009 led a management buyout of the StarDrop business to found Optibrium, which develops software for small molecule design, optimisation and data analysis. Matt has published over 30 peer-reviewed papers and book chapters on computational chemistry, cheminformatics and drug discovery. Michael Shultz earned a B.A. in Chemistry from Albion College, a Ph.D. in Organic Chemistry with Professor Jean A. Chmielewski (Purdue University) and then postdoctoral training with Professor Laura L. Kiessling (University of Wisconsin). He joined Novartis (Summit, NJ) in 2001 in the Arthritis and Bone Metabolism department, moved to the Oncology disease area in 2004 (Cambridge, MA), spent a year in CNIBR (Shanghai), then three years in the Immuno-Oncology group prior to joining the Cardiovascular and Metabolism disease area (2017). He led projects targeting HDACs, Tankyrase and IDO while leading chemistry groups in Oncology, Chemical Biology (CNIBR) and Heart Failure. His contributions to four compounds currently undergoing clinical trials helped spark an ongoing interest in how metrics and properties are used during molecular optimizations. Following his PhD in organic chemistry at the University of Pittsburgh, Thomas took a postdoctoral research position at Harvard University. In 2012 Thomas joined Abbott Laboratories just prior to the spinoff of AbbVie and has been part of the medicinal chemistry group in Worcester, Massachusetts for the past 6 years, engaged on multiple small molecule drug discovery efforts as a synthetic chemist. Tom joined Intellegens straight from his PhD in theoretical physics at the University of Cambridge, and is now leading the application of Intellegens’ novel deep learning approaches to a wide variety of industrial applications. Tom is interested in developing machine learning approaches to solve previously intractable problems, in drug discovery and elsewhere. To comply with security at the Takeda site, registration is now closed. Note: Access is via a dedicated entrance on Franklin St. Photo ID is required.